I may not know much about shopping garage sales, but I’m a pro when it comes to shopping consignment events to save on clothing, toys and gear for my kiddos. Think of consignment events like one big garage sale – parents collect items that their kids no longer need or use, then clean them up and set prices, and finally bring them to be sold along with lots of other items in one big sale. 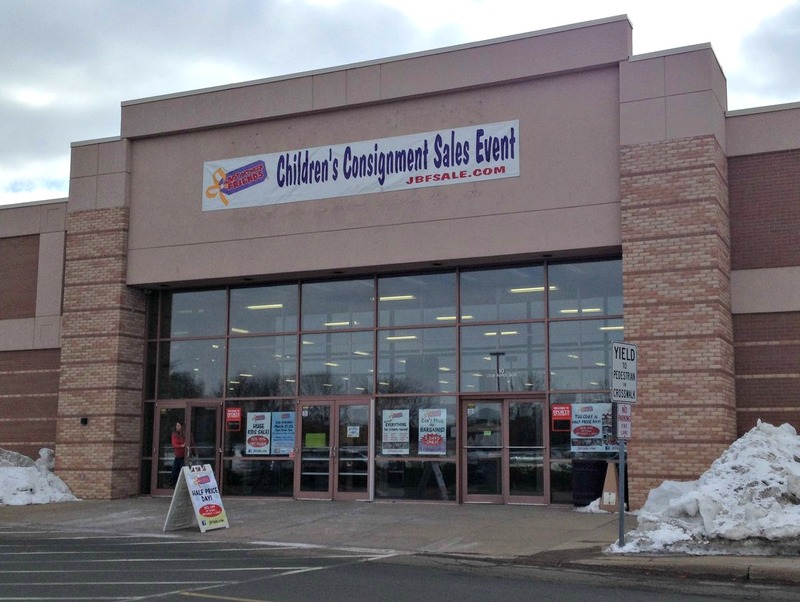 Consignment sales can be overwhelming, but they don’t have to be! 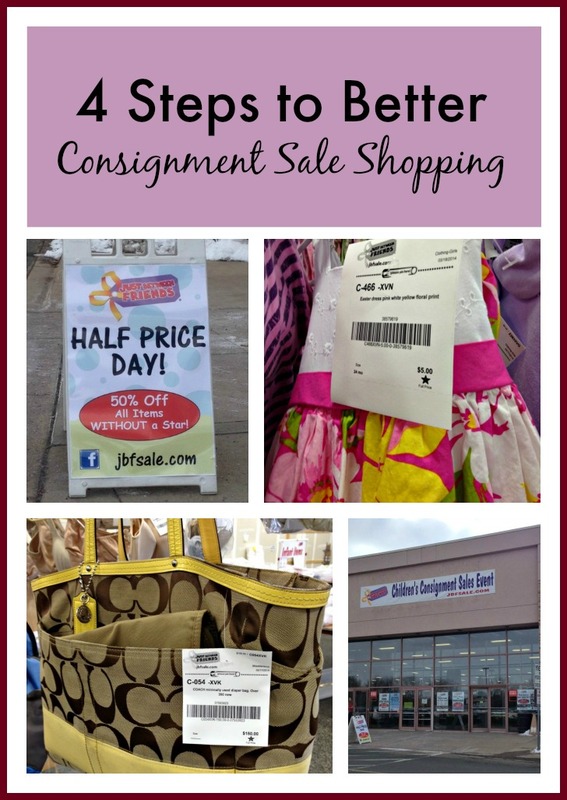 Here are 4 Steps to Better Consignment Sale Shopping. The first step in shopping consignment events is figuring out where and when a sale is taking place near you. Just Between Friends is the largest consignment event franchise in the U.S. so you’ll most likely find an upcoming sale near you when you search their website, but you’ll likely find other events near you by performing a simple search online. If you live in the Puget Sound area, we’ve already compiled a list of Puget Sound Consignment Events that you can reference, but if you live elsewhere just do a search for “[your area] + consignment events” to pull up a list. If you have the time and energy, I recommend shopping multiple sales in your area to save throughout the year. The #1 tip I have for shopping consignment events is this: know exactly what you’re looking for before you go to the sale. It’s very easy to walk into an event and be totally overwhelmed by the sheer amount of items available, but if you go in with an idea (even a quick list) you’ll be much more focused. Before I shop a consignment event, I assess my kids’ current clothing needs. 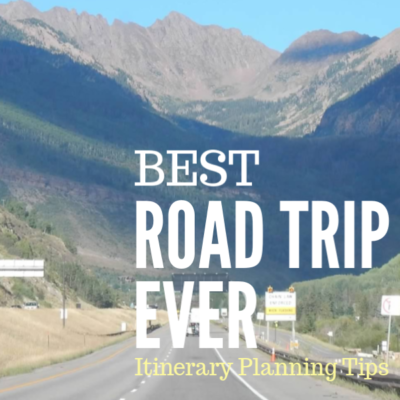 For example, I might jot down that I need a swimsuit, swim shoes and summer dresses for my older daughter (age 3) as well as play clothes for my son (age 5). It’s also very important to know your sizes. I like to buy a little big, but not too big, to make sure I have enough to keep my kiddos clothed and covered before the next sale comes around (I usually shop two or three sales per year). If you’re planning to buy shoes, trace your kids’ feet and cut them out – the tracings, not your kids’ feet 🙂 – and bring those with you so you don’t have to remember if Little Susie is a size 7 or a size 8 right now. Don’t forget that these sales often have bigger-ticket items, too. I’ve gotten highchairs, bouncers, and larger gear for my kids at previous sales with very little trouble. Before you shop, be sure to check the dates and times of the sale. 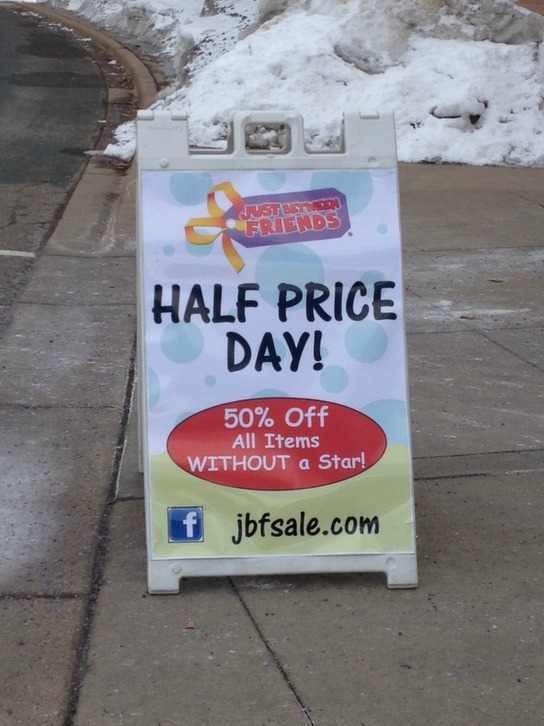 You might need to pay admission the first day or two, and later days of the sale may have items marked down by 50%. Check the event’s website for full details. If you’re gung-ho, consider presales. These are special events just for new moms, volunteers, consignors, etc. that give you early access to the full collection. To be honest, I’ve never shopped one of these presales because a) I simply just haven’t needed that much stuff and b) I’ve gotten so many good deals by shopping the last day of the sale that I haven’t felt the need to shop early. But that’s just me. Also be sure you know what form of payment the sale accepts (larger sales will accept credit/debit cards as well as cash). If a particular sale you’re shopping is charging admission fees, use a coupon if they have them! 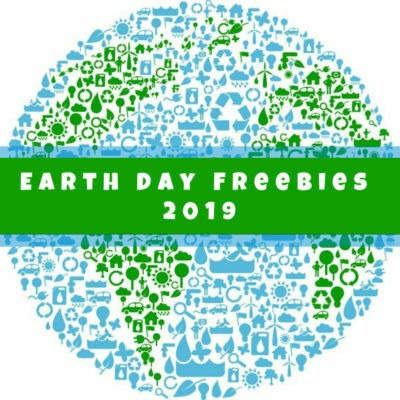 Just Between Friends in my area always charges $2 for admission on the first day of the sale, but everybody and their mother seems to have free admission coupons to give out so I never pay for that. Check the event’s website, their Facebook page, ask around, etc. to see if there’s a discount available. I said this before, but it’s a worth another mention: shop half off or discount days near the end of the sale if you’re not desperate to get a particular item. 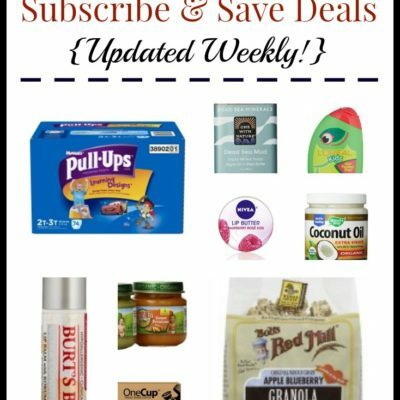 I’ve still found many, many good deals by shopping on these dates. Back to the sale itself – if at all possible, do not bring your kids with you. Just don’t (trust me on this one). The last thing you need is having them beg you for a specific toy while you’re tracking down items on your list. You may think it’d be nice to have them around to try things on, but there usually isn’t a lot of space to do this (plus, that’s why you have their sizes written down in advance, anyway, right?). They may be cute…but don’t do this unless you absolutely have to. Trust me. 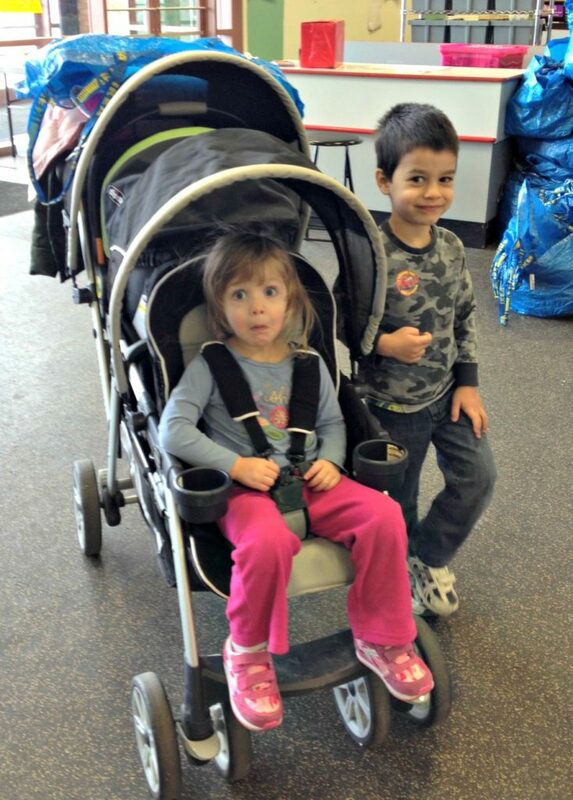 Along that same note, don’t bring a stroller unless it’s later in the sale and you know it won’t be super duper busy. The sales that I shop have the big blue IKEA bags available for you to stuff a bunch of stuff in. I actually have brought a stroller to these sales before, but I usually shop near the end of the sale where traffic isn’t quite as crazy. I like to have a set price point in my mind before I start looking (for example, no more than $10 for coats, $3 for shirts, $5 for swimsuits, etc.). This helps you quickly pass over items that aren’t in your price range. Along that same note, since it’s a consignment sale and people can set their own prices, you may find that two of the exact same item might be priced differently. Case in point: these two play ponies were sitting right next to each other at a recent sale. Yes, there are a few differences in condition, but one is $13.50 (full price) and the other is $10, or just $5 on a half off day! You may need to dig a bit to find good deals. I prefer brighter colors for my kids so that’s what I gravitate toward, and I’ve gotten really good at skimming quickly through the racks. Don’t overthink it – you’re sure to find something that will work! Is this in good enough condition that I feel comfortable paying this amount for it? I ask that second question because it’s usually the case that all sales are final, and you want to be sure the items you picked out are worth what you’re paying. I’ve found that Just Between Friends does a good job of looking over items before they go on the racks to be sure things aren’t stained, ripped, etc. but every once in a while something slips through the cracks. I recently shopped a Just Between Friends sale in my area and took a lot of pictures so you can get an idea of what it’s like. Take a look! 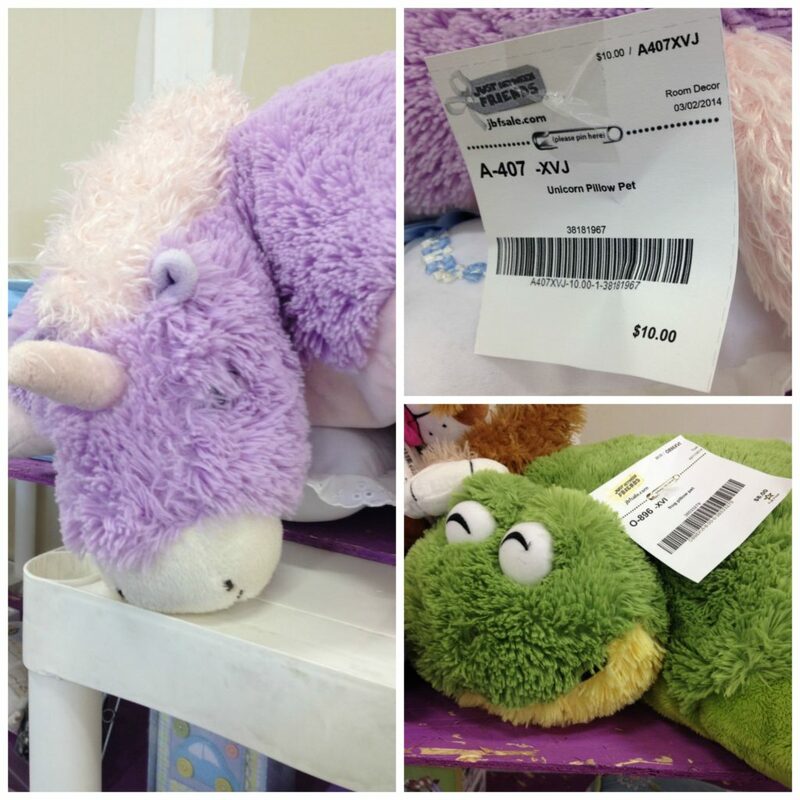 Pillow Pets starting at $5 (on half off day). 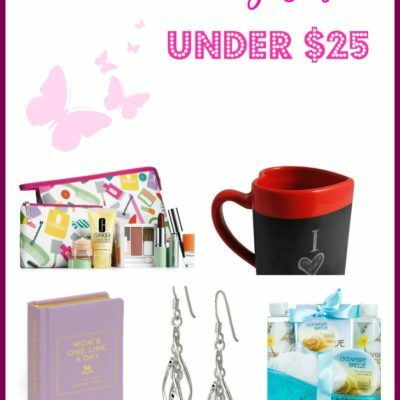 Several cute dresses and swimsuits for my daughter at great prices and brands – Gymboree is my favorite! 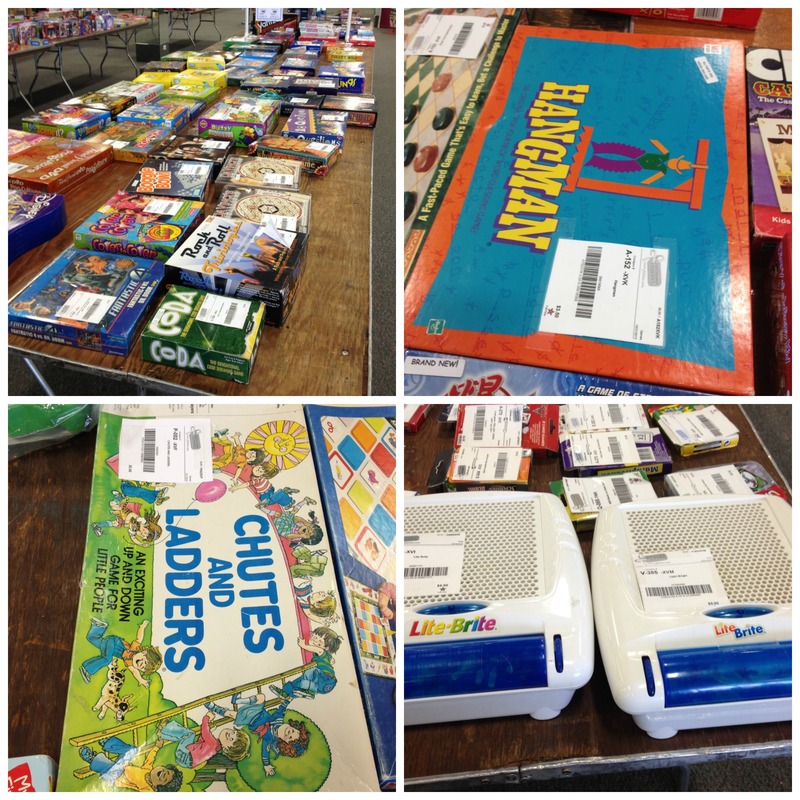 Old-school board games and other games (lots of new ones, too) at great prices – that Chutes and Ladders box looks exactly like the one I had when I was a kid. Although I don’t recommend bringing your kids to these sales, you gotta do what you gotta do sometimes. 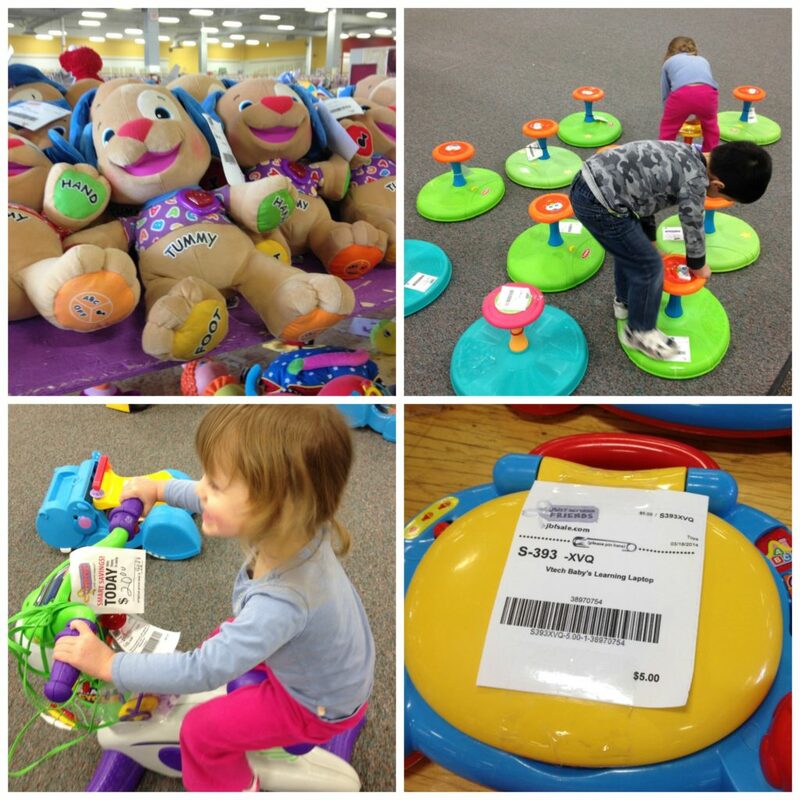 My kids had a blast playing while I browsed nearby. 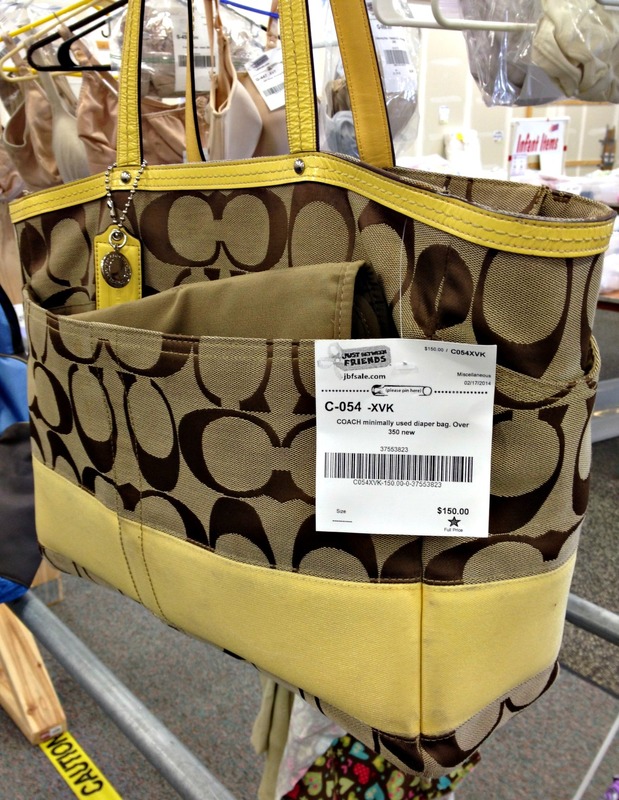 They do have some designer-brand items – this Coach diaper bag was $150 (I’d never pay that much personally, but obviously someone did to buy it in the first place, right?). 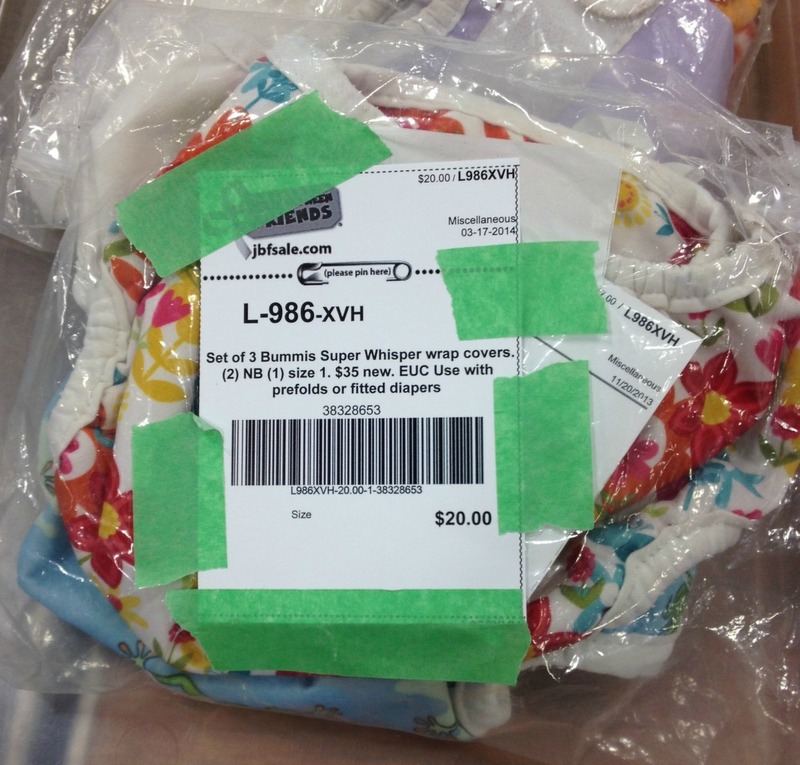 Cloth diapering items like these cloth diaper covers for $10 (half off). 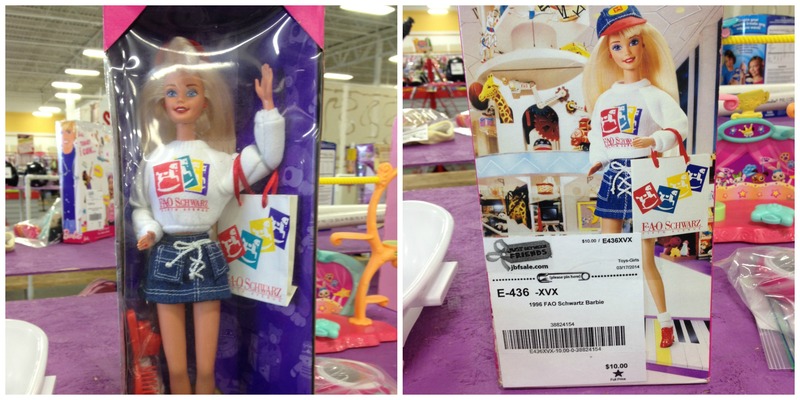 This FAO Schwarz Barbie doll – from 1996! – was $10. 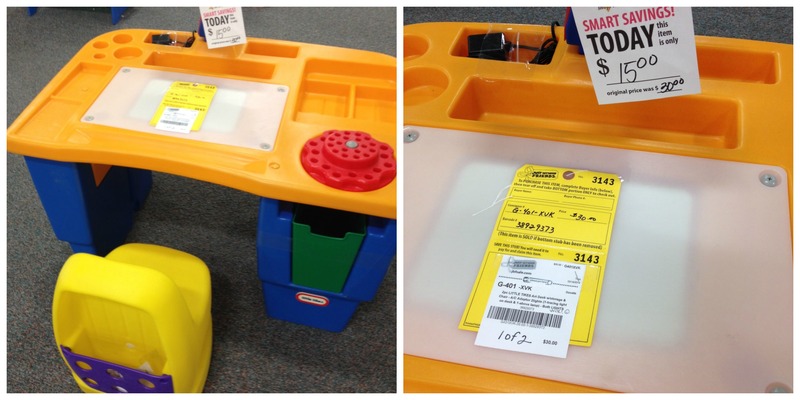 I almost snatched up this Little Tikes art desk and chair for $15 (on half off day). 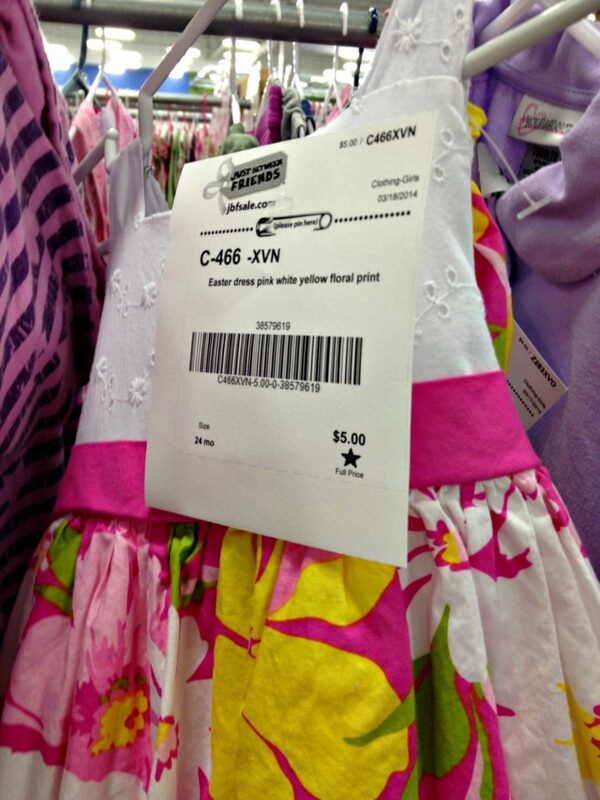 This sweet little Carter’s Easter dress was in excellent condition and was $5 – too bad neither of my daughters was the right size for this one! I’d love to know what other tips you have for shopping consignment events! What’s your strategy? Thanks for chiming in with these thoughts – good point on the cash, in particular!